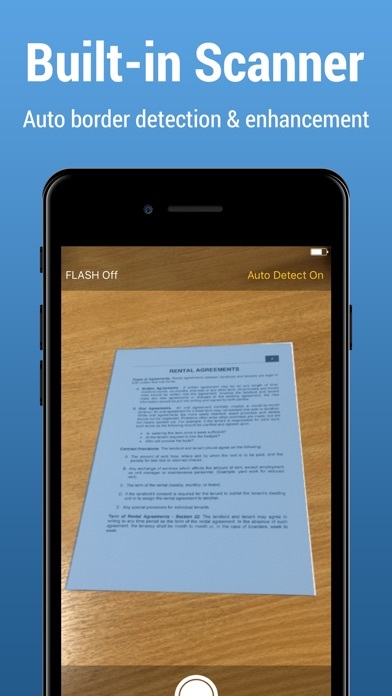 Receive and send fax from iPhone or iPad with FAX.PLUS. Using this secure and reliable online fax service, you can turn your iPhone or iPad into a powerful fax machine and send free fax from your device. You can get an online fax number and receive faxes on your phone as well. • FAX.PLUS recognized as the best online fax service! 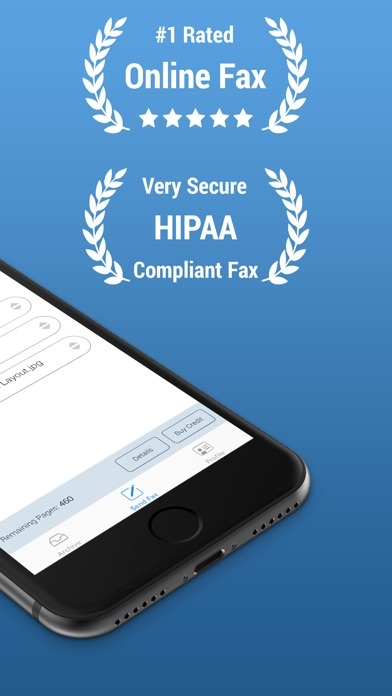 • HIPAA Compliance: FAX.PLUS is a HIPAA compliant online fax service that enables you to send and receive fax from anywhere, anytime and from any device (computer, smartphone, and tablet). 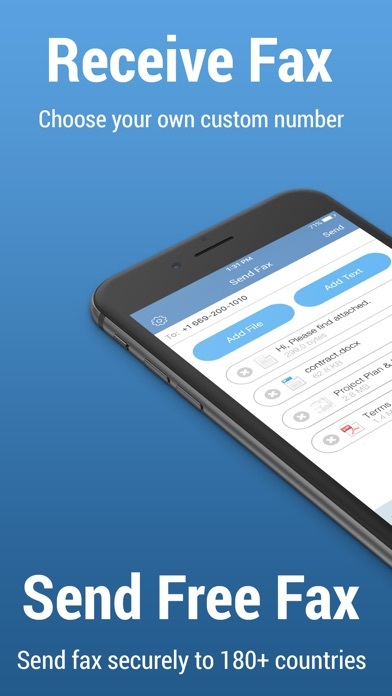 Send fax from iPhone or iPad: On your iPhone or iPad device, you just need to use the built-in scanner to scan the document you wish to fax, add the recipient's fax number and send your fax right away. There is also the option to attach documents from your local storage or iCloud Drive. 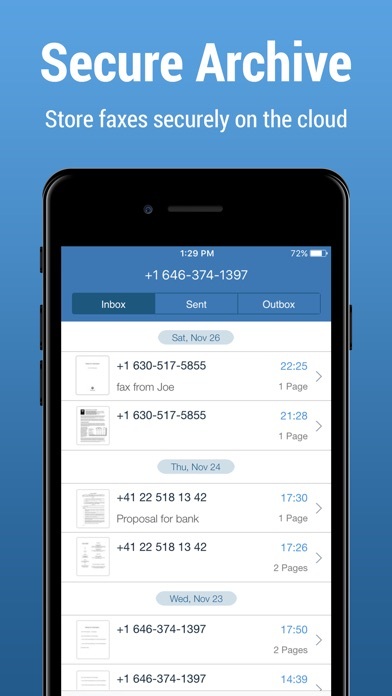 Receive fax on your iPhone or iPad: You can get an online fax number from supported countries worldwide, and be notified via push notification as soon as there is a new fax in your inbox. Encrypted archive: All sent and received faxes are stored in a fully encrypted archive for your future reference. Scan documents: If you only have access to the physical document you wish to fax, you can use the built-in scanner and create a digital copy of your documents. The fax-ready documents can be adjusted and customized to increase the quality of your sent faxes. 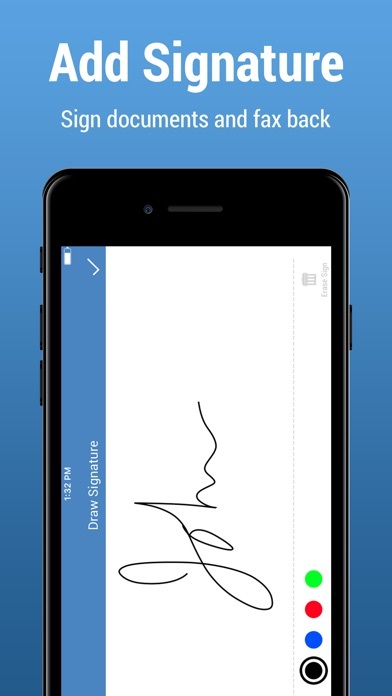 Sign documents on the go: The electronic signature feature makes it easier than ever to sign documents and fax them back without even printing a single page. Features and advantages: • Send and receive faxes anytime and anywhere • Send fax from email (email to fax) • Programmable fax API • Scan documents with your mobile camera (automatic document detection, border cropping, perspective correctness) • Upload and attach your documents (Supported formats: Microsoft Office Documents, PDF, JPG, PNG, TIFF) from your device or your cloud storage (Google Drive and Dropbox) • Add a cover page to your fax with our ‘Add Text’ feature • Sign your documents or faxes and send them back without printing them! • Forward, reply or resend your faxes to any fax machine • Send fax to your contacts stored in your mobile phonebook • Organize your fax archive by adding notes to your sent and received faxes • Schedule your fax to be sent at a defined date and time • To ensure maximum delivery rate, enable the Retry for failed faxes feature available in the options of the Send Fax page. All failed to send faxes will be re-sent at an interval you define. • Receive notification of your sent and received faxes to your email address. Need to notify more people? Configure up to 5 email addresses! • Send fax to a Human Operated Fax Machine: By enabling this feature, your destination contact will hear a prerecorded message stating: ""This is fax call, to receive please press start."" • HIPAA compliant online fax service A Wide range of plans for different needs Entrepreneur, Professional or Company? Take a look at our range of plans to find the one that fits you best! Our range of plans start at $4.99 per month and allows you to get a local fax number from over 40 countries from which you can receive and send faxes to over 180 countries. https://www.fax.plus/pricing. If you need to send a couple of faxes per month or per year, the free plan (also known as the pay as you go plan) enables you to buy credit to be used for sending faxes. What if FAX.PLUS doesn't provide a fax number from my country? We are constantly adding new local numbers. If you need to receive faxes in your country which is not one of the current ones we work with, please let our customer support (support@fax.plus) know and we'll get back to you as soon as you can get a local fax number in your country. Any further questions or requests while using this secure and reliable online fax service? Do not hesitate to reach us on our website, app or by email at support@fax.plus. Our customer support team will be pleased to help you! Easy to use, I don’t have a business so with the Free option, I can use when I need to. No marketing gemic to hook you for something you don’t need all the time. I will definitely forward this app to others. I don’t need to fax often, but when it is needed this app is such a convenience. This is so great , I have all my faxes sent to me easy to print from my printer and I can take a picture and send faxes or to a email. Kept saying the fax number was busy when it wasn’t.